(2) Has the legal experience and ability to get you the money you deserve. Sy Nazif featured in the LA Times. 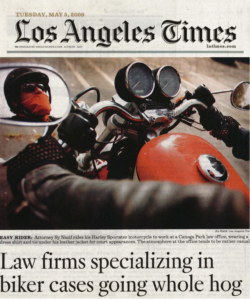 Attorney and RiderzLaw founder Sy Nazif has owned and ridden just about every brand of motorcycle you can think of, from Honda to Harley, from Ducati to DKW. You’ll see him on the road, because he rides almost every day. And he knows what it’s like to be the victim of a reckless driver — he’s got the scars to prove it. Mr. Nazif is an American Motorcycle Institute certified mechanic and “expert status” WERA motorcycle racer. Over his career, Mr. Nazif has successfully handled thousands of cases on behalf of his fellow riders. Because of his expertise, he is a frequent lecturer on motorcycle accident law. Throughout the country, Mr. Nazif teaches other lawyers how to win motorcycle accident cases. RiderzLaw is also the proud owner of the RiderzLaw Racing Team, which competes in MotoAmerica Events throughout the country. 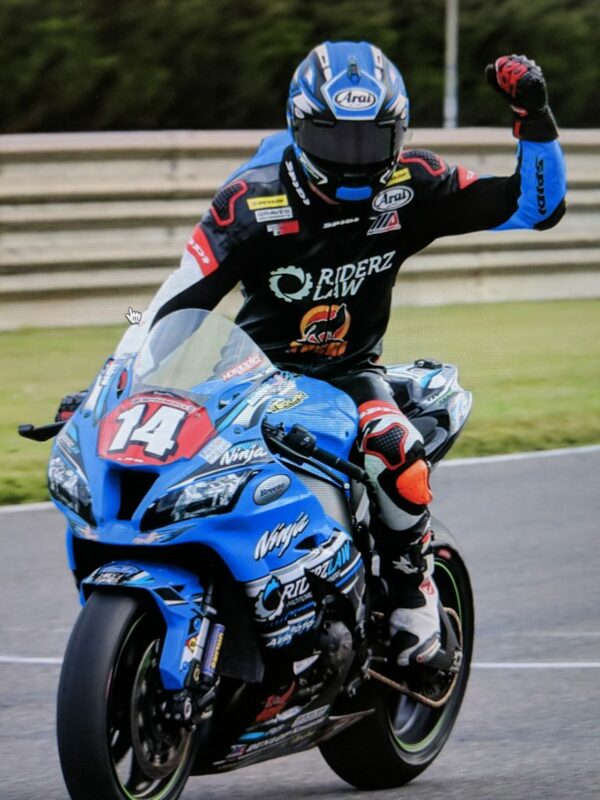 RiderzLaw Racing has won several national championships. The credentials and track record of our lawyers are unmatched. Attorney and RiderzLaw co-founder Rob Marcereau won two of the largest awards in history regarding unsafe and defective roadways – for $12.2 million and $11.9 million. Rob Marcereau Daily Journal cover after winning two record-breaking judgments. 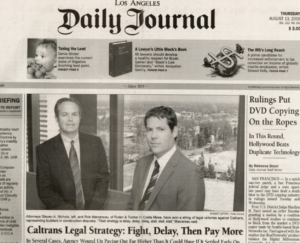 After these victories, Mr. Marcereau was featured on the cover of the Daily Journal, one of the largest legal newspapers in the country. Since that time, Mr. Marcereau has continued to win huge judgments for his clients throughout the country. 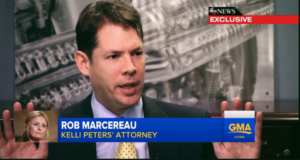 After a recent, $5.7 million jury verdict, Mr. Marcereau was featured on national news, including Good Morning America and ABC 20/20. Over their careers, Mr. Marcereau and Mr. Nazif have won in excess of $100 million dollars on behalf of their clients. Rob Marcereau on Good Morning America. Ranked Best Attorneys in the Industry. Mr. Marcereau and Mr. Nazif graduated from two of the best law schools in the country – USC Law School in Los Angeles and the University of California Hastings School of Law in San Francisco. Both Mr. Marcereau and Mr. Nazif have received many honors and awards, including induction into SuperLawyers and a “Superb” rating on Avvo, two independent rating systems for lawyers. Our attorneys have received the highest possible ratings by independent agencies. Mr. Marcereau is also a lifetime member of the Multi-Million Dollar Advocates Forum, a society reserved for attorneys who have obtained multi-million dollar trial verdicts. Membership is reserved for trial lawyers who have won multi-million dollar awards. Defense lawyers and insurance companies know our reputation, and often opt to settle our cases rather than face us in court. They know that when the RiderzLaw attorneys go to court, we go to win. We don’t shy away from hard work, because we know that going the extra mile in research, investigation and preparation can mean the difference between a good outcome and an outstanding outcome. Although we fight aggressively against the other side, we treat our clients and their families with the utmost compassion and respect. We understand that when you or a loved one have been injured in a motorcycle accident, it can be an incredibly stressful and emotional time. We try to make the legal process as easy and comfortable for our clients as possible, keeping them informed every step of the way. In short, we treat our clients the way we would expect to be treated. Thank you for your interest in our firm. We look forward to serving you.